Since my hubby had a rough week at work, I offered to cook him something special for dinner. His request was “lamb.” I wanted to make something tasty but also healthy, and with leaner meat. Thanks to Food & Wine, I typed in healthy lamb and found this delicious, fairly easy recipe that really did the trick. Optional: Garnishes — sliced green onion or chopped cilantro. Served with — steamed rice or rice noodles. 1. Mix together the sherry with three tablespoons soy sauce and the corn starch. Mix in the lamb well and allow to marinate. 2. 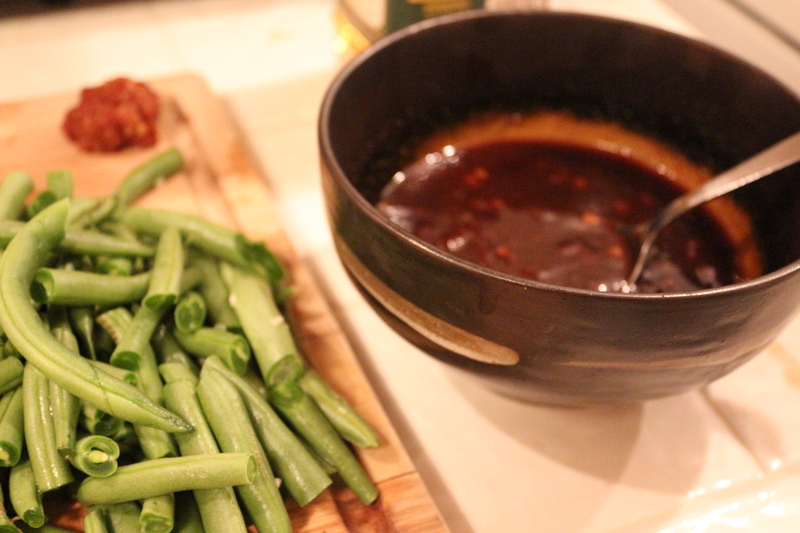 Make the sauce: in a bowl, combine the hoisin sauce, vinegar, chile-garlic paste, sugar and remaining soy sauce. Mix well and set aside. 3. THIS IS VERY IMPORTANT: Prepare all of your veggies before you start to cook. I personally am a multi-tasker when I cook — I chop an onion, and then I cook it while I chop the next item. This stir fry moves fast, so have everything ready before you start cooking. 4. 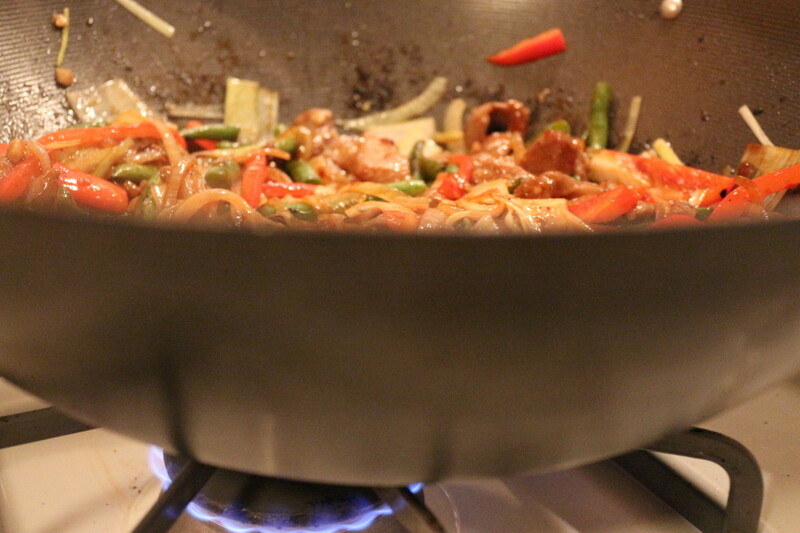 Heat 1 tablespoon oil in a wok until smoking. Add the garlic and cook for 15 seconds. Then add the lamb, and stir fry for about 7 minutes until mostly cooked. Transfer to a plate. 5. ANOTHER IMPORTANT STEP I WISH I KNEW ABOUT WHEN I MADE THIS: After cooking your lamb, rinse out your wok so there is nothing stuck in there. Otherwise it burns and is tough to get out while you are cooking the other veggies. 6. Return your wok to the stove, add another tablespoon oil, and then add the green beans, stir-frying for about 4 minutes until tender. 7. Add the final tablespoon oil (if your pan looks dry), and add the sliced onion. Stir fry until softened, about 3 minutes. Then add the peppers and leeks and cook until they are softening, about 4 minutes. 8. Add the sauce and allow to bubble. Then add the lamb and mix to incorporate. Let the entire mixture cook over medium heat for about 5-10 minutes. Then serve with optional garnishes, over rice/rice noodles, or as is. 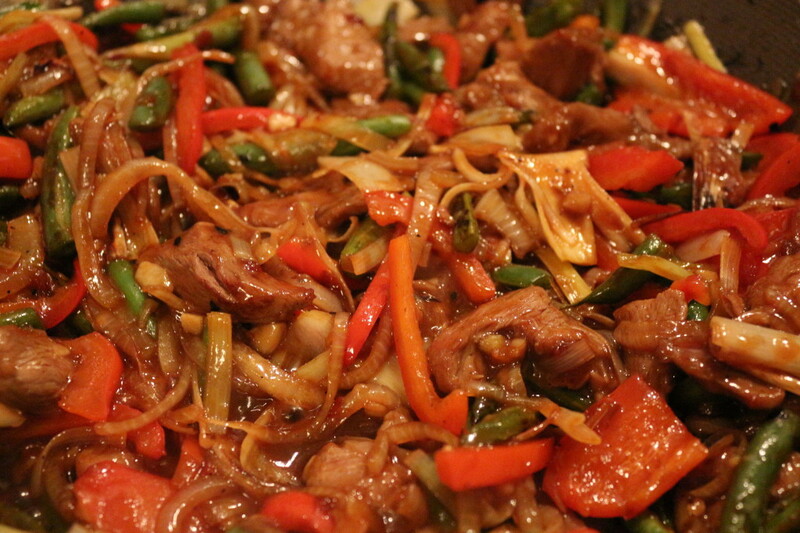 This entry was posted in Mains and tagged Asian foods, LAMB, SPICY. Bookmark the permalink.